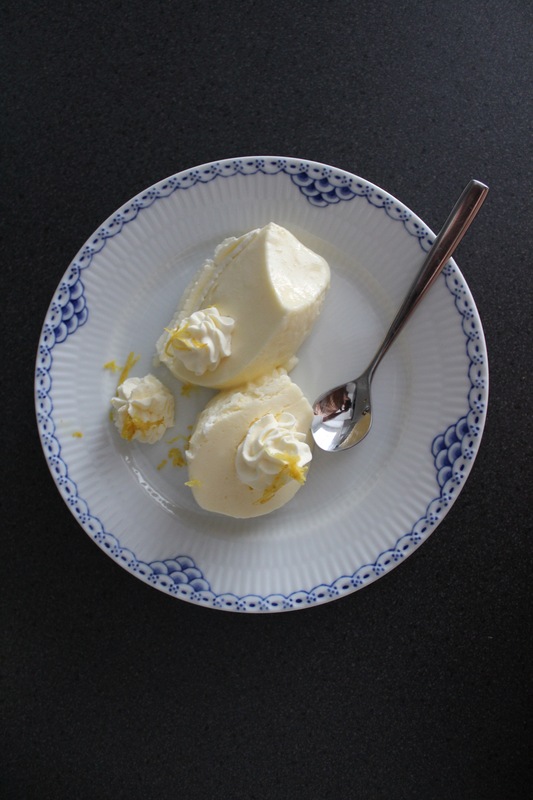 Lemon mousse or cream pudding as you can call it, is original a dessert from Northern Italy, but here in Denmark, it´s also a very old favorite. I think that is was very In , in the sixties, but it has been out of the food fashion picture for many years, but now it´s back, and have been for a while now. In my family however, it has always been out. My great grandmother used to make it for my mom, when she was a little girl, every time she came visiting. My great grandmother Marie, always said to my mom that she made it for her, because it was her favorite, though in fact, my mother hated it. So she never made it for me, luckily for me, I can make it myself. I think it taste okay, not my favorite, but I do like it. It´s very much like a mousse, but there is a lot more cream in it. I went with a very easy standard recipe, then you can always add extra, if you want. 1. Soak the gelatine and melt it over a water bath. 2. Beat the egg yolks with the sugar in a bowl and add the grated zest and lemon juice. Pour the lukewarm gelatin into the bowl in a thin stream while you whipping. It´s important that the gelatine is the right temperature, that way, it want make lumps in the mousse. If it´s too hot or too cold, it will make lumps. To make the risk or this smaller, then you can sieve the mixture before adding the cream. (I did that, and it worked out fine. gelatine lumps in the mousse, can really ruin the mousse. 3. Whip the cream until it is stiff and turn it in with the mixture. Finally, whip the egg whites completely rigid and turn that in the mixture as well . Put it in the fridge for 3-4 hours. I´m so thrilled that it´s finally getting warmer. I love it. Have a lovely day everybody. Remember sunscreen, the sun can be quite sharp, I’ve already got some sun, even though I use SPF 30 and 50 in the face. This entry was posted in Food, Sweets and tagged cirtonfromage, citron, lemon, mousse, oldfashion, pudding, sweet. Bookmark the permalink. Looks so delicious! Even I posted something about mousse but with some different ingredients! Thank you. Your´s look very delicious as well. I love blackberries. I think I have t try and make that some day.